This tool helps to rename bulk files and folders recursively. It was written in using WPF/C#/VS.NET 2010. Click ‘Start’ whenever you are ready to rename files. Any time you can can start this process. Type a full path of the file or folder in ‘Choose a File / Folder’ text box, then click ‘Add’ button to add it to ‘File(s) / Folder(s)’ list box. 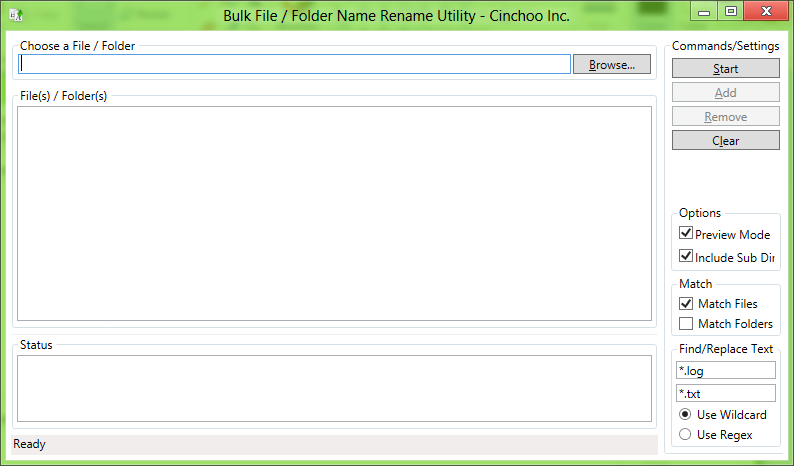 Or you can click ‘Browse’ button, to choose the file/folder for rename. At any time, you can select an item in ‘File(s) / Folder(s)’ list box, remove it using ‘Remove’ button. Check ‘Match Files’ or ‘Match Folders’ check boxes, in order to include them for rename process respectively. Check ‘Preview Mode’ option, if you just want to see the files and folders are renamed in the ‘Status’ box or in the log file under ‘Logs’ folder. This option will not rename the files or folder names. Check ‘Include Sub Dir’ option, to include all sub directories for rename process. In ‘Status’ box, you can view the statues of the file renames. Click ‘Clear’ button anytime to clear the ‘Status’ box. You can drag and drop file(s) or folder(s) to this tool for easy cleanup process. In this article, I’ll show you how to turn your console / winform application to Windows System Tray application. Cinchoo framework provides a single hosting infrastructure to turn your application either Windows Service or Windows Tray application through configuration. Decorating the above class with ChoApplicationHostAttribute will make the application to be run as Windows Service. And override OnStart method, where application start up code placed there. 5. In the main entry, do as below. That’s all, you application is now ready to run as self installable windows service application or Windows Tray application. Here is how to turn your application to Windows Tray application. In ChoCoreFrx.xml file, set ‘turnOn’ flag to ‘true’ in trayApplicationBehaviourSettings element. showInTaskbar – true, will show the application in Taskbar. false, otherwise. hideMainWindowAtStartup – true, will hide the window at the application startup. Otherwise false. hideTrayIconWhenMainWindowShown – true, tray application icon will hidden when the main windows shown. Otherwise false. trayAppTurnOnMode – This option is applicable to WinForm application only. Possible options are OnMinimize, OnClose, OnMinimizeOrClose. In this section, I’ll talk about binding your configuration object to WinForm controls. WinForm has rich binding infrastructure, Cinchoo framework works closely with WinForms to bind the configuration object to them seamlessly. Lets walk over how you can do this. PS: WinForm controls only binds to public Properties only. Please make sure you define them accordingly in your configuration object. You can bind the above configuration object to your WinForm window in either constructor or window load event handler as below. That’s all. Now the changes made to configuration source will be reflected in the controls as well as the changes made to controls will be persisted automatically to underlying source based on the binding nature. Try for yourself. UPDATED: In this topic, I’m going to show you how to pass configuration object filepath programmatically. Cinchoo framework addresses this feature through IChoConfigurationParametersOverridable interface. When you define a configuration object, implement this interface as below to override the configuration file path. This article is the continuation of Cinchoo configuration framework series. So far you learned and used various configuration section handler provided by Cinchoo framework in your applications. But it limits the accessibility of the underlying configuration data source somehow. Now Cinchoo framework opens the possiblity of extending the configuration framework by creating your own plug-ins to access various configuration sources by using IChoDictionaryConfigObjectAdapter interface. Let say, you have configuration data available in Database, FTP, HTTP, WebService, WCF, email etc. Now those can be accessed easily using Cinchooframework. Here I’m going to walk you over in implementing one such configuration data source reside in database using ADO.NET interface. (You can try Linq to Sql, ADO.NET Entity Framework etc as well). Create a new class (say, ChoMySqlADODictionaryConfigObjectAdapter) derived from IChoDictionaryConfigObjectAdapter interface. Implement the interface members. GetData() member will be called by framework to retrieve the configuration data. In here you establish connection to underlying source, retrieve the data and return them in IDictionary format. Save() method will be called by framework to save the snapshot (in IDictionary format) of configuration data back to underlying source. Here you establish the connection to the underlying source, save them. Important, while saving, make sure you update the modified timestamp with current timestamp. LastUpdateDateTime property will be invoked periodically by framework to identify the changes to the underlying configuration source. In here, you will have to establish the connection to the source and retrieve the modified datatime. Define a configuration class ‘ApplicationSettings’, decorated with ChoDictionaryAdapterConfigurationSection attribute as below with sectionName, and the type of the adapter ChoMySqlADODictionaryConfigObjectAdapter. That’s all. Your configuration object is all set to use the configuration object data from database using ChoMySqlADODictionaryConfigObjectAdapter. In a situation, where you want to keep and maintain configurations for each environment (DEV, UAT and PROD etc) separately in a centralized location, attach them to your application and/or switch them at run-time, all these can be done using Cinchoo configuration framework. This is the first of the series of articles about SharedEnvironment in this blog. SharedEnvironment.config file is a xml based configuration file shared by many applications. It contains configuration entries which controls the location of the application configuration locations and optional machines list for each environment etc. Now lets walk over the specification of SharedEnvironments.xml file. baseAppSharedConfigDirectory – A configuration directory used by an environment whose appFrxFilePath is not specified or it contains relative file path. In the above sample, the ‘DEV’ environment will create or use the ‘C:\Config\DEV’ directory to consume configuration files. The environment ‘UAT’ uses ‘C:\Config\UAT’ directory to read / store configuration. If not specified, it will be defaulted to application binary base directory. defaultEnvironment – An environment used by the host which is not listed in this xml. In this sample, the ‘DEV’ environment will be used by the host not attached to any environment. Each environment can be created using ‘environment’ element. In the above sample, we have ‘DEV’, ‘PROD’, and ‘UAT’ environments. name – Name of the environment, mandatory. freeze – true, all the hosts belongs to the environment locked. The applications hosted on these machines are locked to use this environment. By no means, it can be overridden via App.Config file in appFrxSettings/appEnvironment section. False, it can be overridden. Default value is false. Optional. appFrxFilePath – A file / directory path. Either absolute / relative path. In case of relative path, framework resolves the path in relative to ‘baseAppSharedConfigDirectory’ path. In the sample above, for the ‘DEV’ environment, this path resolved to ‘C:\Config\DEVConfig’. If missing/not specified, the path will be the environment ‘Name’ under ‘baseAppSharedConfigDirectory’. In the sample above, the ‘UAT’ environment will resolve this path to ‘C:\Config\UAT’. It is optional. Then you can bind hosts to any environment using ‘machine’ element under ‘environment’. Host can be either MachineName or IP Address. Also the those host names can contain wild card characters as well. Cinchoo framework simplifies the Windows service development. An application developed in this approach is ready to run as Console application as well as self install-able Service application. In this article, I’m going to walk over the steps of creating service development. Make sure the type is decorated with ChoApplicationHostAttribute. And override OnStart method, where application start up code placed there. Implement any other service related (OnStop, OnShutdown etc) methods by overriding them. That’s all, you application is self install able windows service application. You can run it as console application or install it as Windows service also. To get the help on Windows service commands, pass /@? ChoServiceInstallerSettings – service process parameters used during installation of service. ChoServiceProcessInstallerSettings – service credential parameters used during installation of the service. First, let take a look at the way configuring them through configuration file. If you want more information about each attribute/element in the above xml section, please visit ServiceProcessInstaller Class in MSDN. If you want more information about each attribute/element in the above xml section, please visit ServiceInstaller Class in MSDN. Next, let take a look at the way of overriding them programmatically. Override ApplyServiceInstallParamsOverrides method in your ApplicationHost class, where you can changes service installation parameters. In the above sample code, we are trying to override the ServiceName and DisplayName as ‘Test’. When you install the service, it will be created as ‘Test’ service. Here I’m going to talk about couple of tips on using Cinchoo framework in your project. At the start of the application, you must call ChoFramework.Initialize() to initialize the framework and start necessary services. Usually you must place this statement in application Main entry point as below. Calling ChoFramework.Shutdown() method is not mandatory to call. But it is safe to make this call for graceful shutdown of all the background services. 1. Define the configuration section object decorated with ChoXmlSerializerConfigurationSectionAttribute as below. Declare a data member of type ChoCDATA.